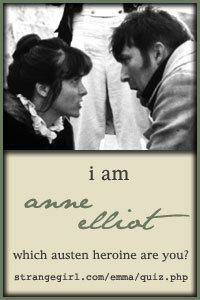 I am not surprised to find I’m Anne Elliot. She’s always been one of my favorites. When I was younger, I loved Lizzie Bennett (and Pride and Prejudice), but now I find I’m a huge Persuasion fan. I just relate a little better to Anne, now that I’m older. Besides, who can resist Captain Wentworth! At least I didn’t turn out to be Marianne Dashwood! Thanks to Deanna Raybourn for the link!